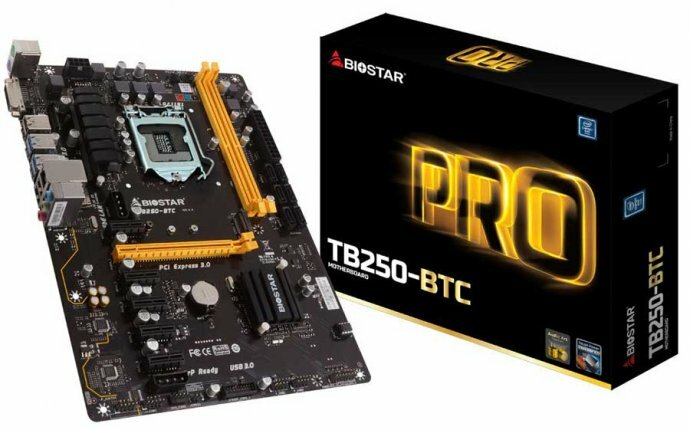 Biostar announces its latest B250 motherboard to join its product line this generation with the introduction of the BIOSTAR TB250-BTC mining motherboard designed for dense bitcoin mining operations. Press-release: The new BIOSTAR TB250-BTC motherboard features enhancements provided by the new Intel 200 series as well as improved efficiency by the latest 7th-generation processors. The BIOSTAR TB250-BTC is designed to be the newest, most stable and durable foundation for bitcoin and cryptocurrency mining. Bitcoin mining and other cryptocurrency have become more widely known these days and the recent resurgence in Bitcoin price has awaken interest in both old and new miners in establishing themselves again in the mining scene. With new GPUs offering more efficiency than previous generation, more GPUs can now be utilized for faster ROI. This trend in utilizing multiple VGA cards can cause extremely hot operating conditions which may affect system stability which may lead to operation disruption with breakdowns and failures. That said, the new BIOSTAR TB250-BTC focuses on improving stability and endurance for extreme operating conditions that can cause potential downtime or similar problems stemming from maintenance issues stemming from unstable motherboards due to extended usage. Crypto-currency trends for Bitcoin and other popular cryptocurrency require dedicating a system that can run for long periods of hours under stress which can easily deteriorate motherboard components. With the BIOSTAR TB250-BTC motherboard, this deterioration is reduced and the rate of which is is slowed down providing less maintenance cost which gives you the benefit of improved ROI. BIOSTAR achieves this by using its expertise in developing high-endurance and stable components for this application. The new BIOSTAR TB250-BTC motherboard will support processors for the LGA1151 socket and will have native support for RAM with up to DDR4-2400 speeds and 32GB in total capacity. The motherboard will feature high-reliability LAN ethernet solution with Gigabit speeds for faster network utilization. Built-in M.2 connector allows high-speed storage support allowing you minimal cable use for maximum cabinet utilization for cards. There’s a lot to consider before getting started in setting up your bitcoin mining rig. We highly recommend starting with AMD graphics card like the Radeon RX 470 VGA. After which, other components are chosen and the necessary parts are ready including PCI-e risers and if you’ll be using around six graphics cards, we highly recommend two separate power supplies. The BIOSTAR TB250-BTC features two dedicated AUX power connector for reinforced power delivery for superior system stability and enhance GPU performance.